In the Internet lexicon, “speedrun” is a relatively new word. Originally coined to describe the practice of playing through a video game as quickly as possible, the word is now also apparently used to describe any thing that breezes through another thing with great alacrity. 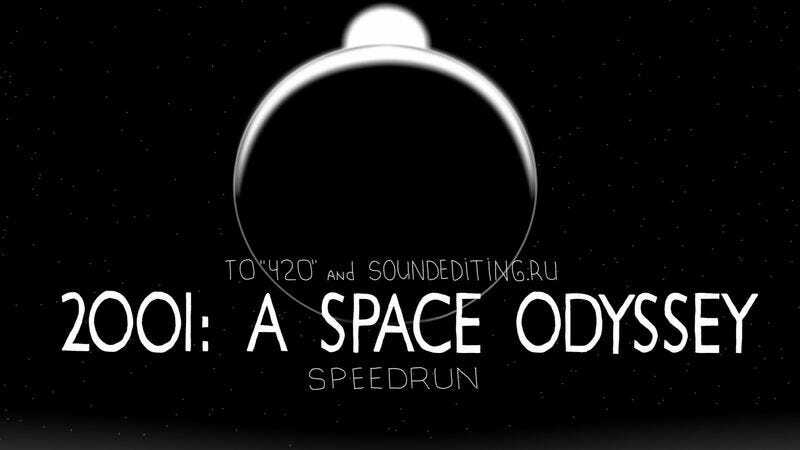 That’s the case, at least with the Speedrun series, a project of Russian animation studio 1A4 that blithely (and profanely) summarizes modern film classics in one minute or less. The company’s newest video tackles Stanley Kubrick’s brilliant (and notoriously slow) 2001: A Space Odyssey, and what it lacks in mind-blowing space imagery it makes up for in jokes that make Family Guy look erudite in comparison. Hopefully Kubrick had a good sense of humor, because otherwise he’s doing backflips in his grave right now.